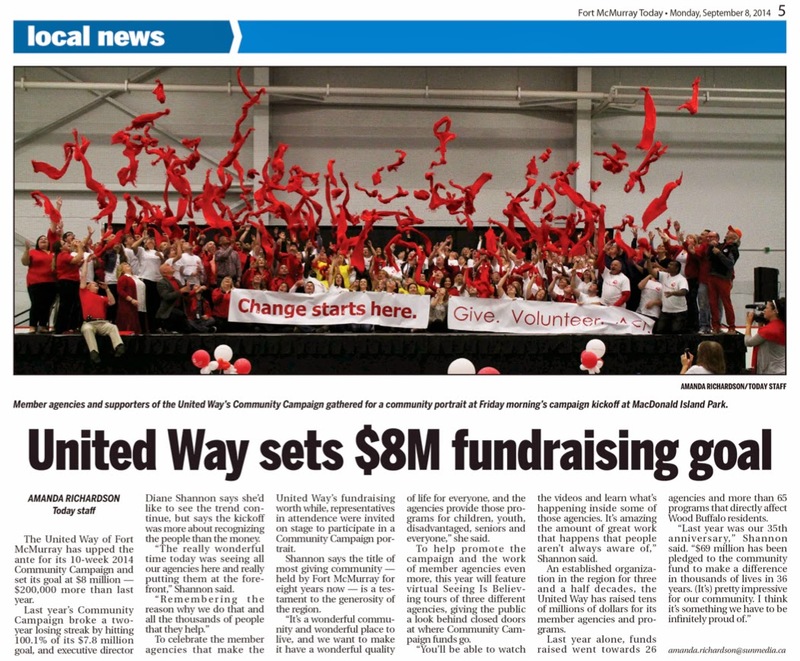 Three months and a day ago I began working with the United Way of Fort McMurray. One of the questions I get asked most often, apart from "How is Heather is doing? ", is "How are you liking the new gig?" I love both questions, but I want to spend some time answering the latter. To be absolutely succinct, I LOVE IT. When I go to work in the morning, sometimes walking (as it's only 3 blocks from the house), sometimes driving (when I have other appointments), there is authentic joy when I get near The Redpoll Centre. Walking up the stairs and saying good morning to everyone is such a great way to start the day. 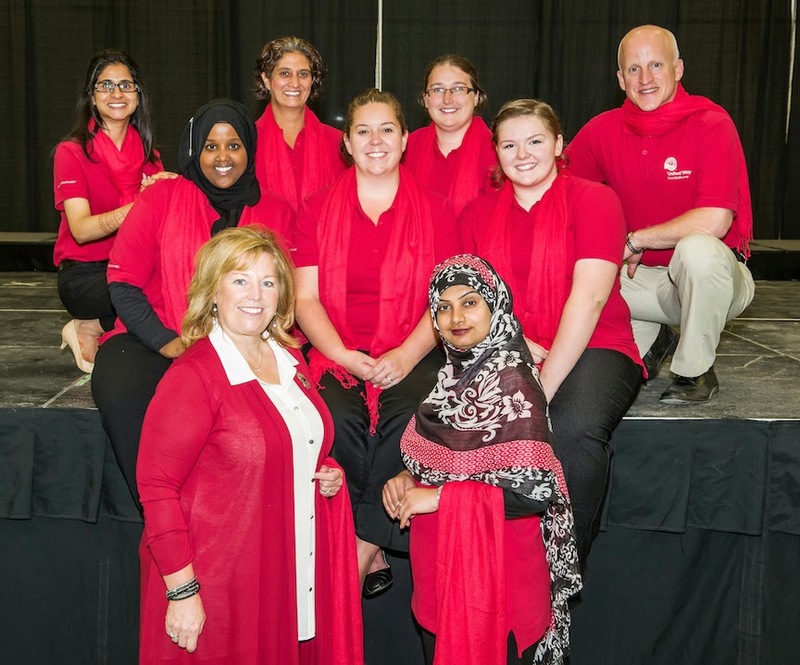 We have a fantastic group of people who are eager to share their strengths and passions. The success of last week's Community Campaign Kick-Off was thanks to the contributions of every single person who helped shape the vision and make it happen. I feel like I'm on am amazing "Dream Team", serving the best interests of our community, workplace campaign teams and member agencies. The Redpoll Centre has been in hyperdrive since August, as Seeing Is Believing tours began and the Tools For School program ramped up. Activity in the centre has heightened in September with the start of the Community Campaign, more tours, and a busy calendar of workplace campaign launches. Excitement is building as we collectively strive for the $8 million campaign goal. Next week, we begin the annual United Way Radio Auction with a robust collection of donated products, services and packages to bid on. I'll be out the door bright and early to announce the items that will be on auction. Just a heads up, that I'll be adding something of my own to the mix: a portrait package, where I go through the creative process of painting the successful purchaser. The list of local folks who have been subject to my wild colours and splatters is growing. You could be next. If you're reading this and you've always heard about the United Way Community Campaign but have never been inspired to give, I would invite you to spend the next two and half minutes watching this video. This is a virtual Seeing Is Believing tour of The Salvation Army. This is just one story, among many, that answers the question of Why? Why should you give? Donate to the United Way of Fort McMurray 2014 Community Campaign right now by clicking here. Be a part of the change that starts here.